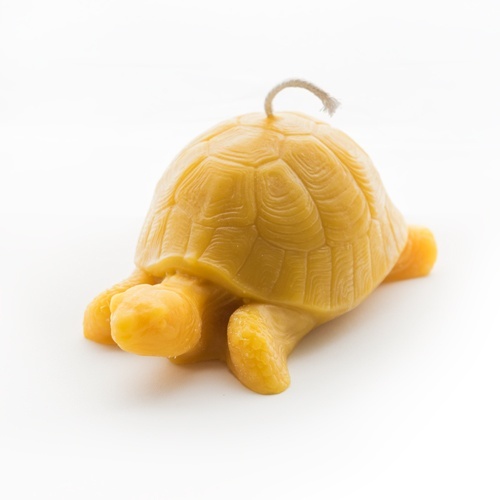 The Turtle beeswax candle is made from 100% pure beeswax and is our largest candle. It’s perfect for indoor candle lighting because it provides a great natural scent and the wax doesn’t drip when burning. The Turtle beeswax candle is the largest candle we manufacture using a whopping 11.5 oz of beeswax. In addition to it's size, it is one of our signature nature candles that closely mimics a life-sized turtle. Like all of our candles, the Turtle is handcrafted from 100% pure beeswax that has been filtered to remove impurities. This allows the candle to provide the soothing aroma of natural honey when lit. A beeswax candle (including the Turtle) is unique in that it burns at a different temperature from most other types of candles. The different burn temperature allows the candle to burn drip-free*. A beeswax candle can be lit on a kitchen table, counter top, or similar surface without having to worry about it dripping.